Each phase is split into steps, each of which is charged of transferring specific data (such as URL rewrite step, EAV step, settings step, etc…). At the first place of a run, a step checks the table structures of Magento 1 and Magento 2 for consistency. Then the actual data is transferred to Magento 2. In the end, this data is verified. This section previews your migration experience by providing a high-level overview of the Data Migration Tool. The data migration tool recognizes the differences in database structure between Magento 1.x versions. Most of these database structural differences are declared in map files. 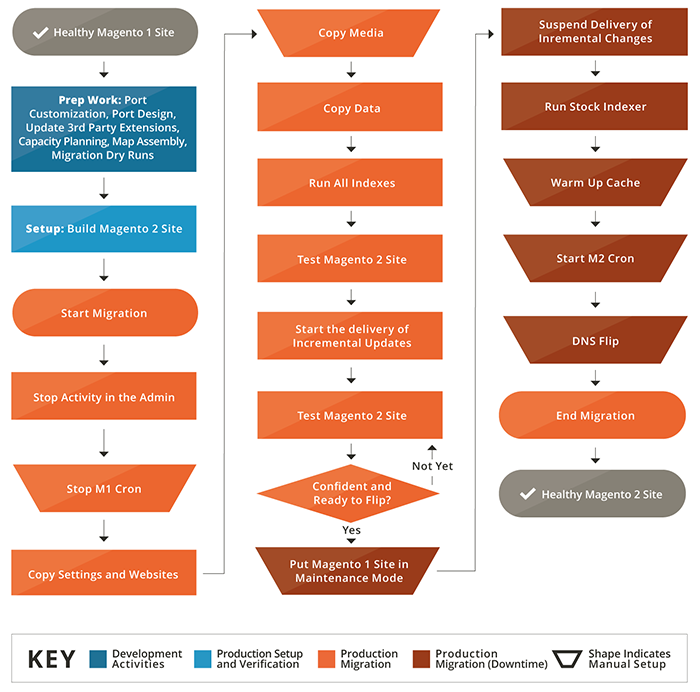 Each step in the process uses map files to transform data for use in your Magento 2 store. For instant, when you transform data from a Magento Open Source 1.8.0.0 database to Magento Open Source 2.x.x, the map file accounts for the fact that a table was renamed and renames it accordingly in the destination database. If there are no differences in data structure or data format, the Data Migration Tool transfers it as-is to the Magento 2 database, including data from tables created by extensions.